“Field Work,” a show Georgia Southern University, features all the broadsides ever published at Broadsided Press and, on the opposite wall, photographs and writings from editor Elizabeth Bradfield’s forthcoming book, Toward Antarctica. The broadsides are displayed “street-style,” wheatpasted to seven raw plywood panels mounted to the gallery wall. Elizabeth Bradfield talking with students at the exhibit about broadsides at the Georgia Southern University exhibit. The director of the gallery, Jason Hoelscher, loosely organized the installation by following “rivers” of light and dark in the broadsides. A few tabloid-sized broadsides, for variety, punctuate the array. 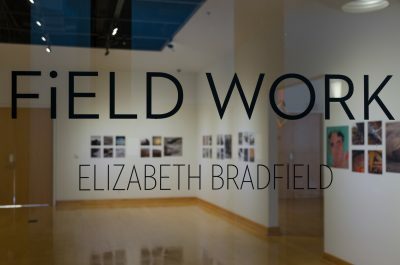 The title of the show, “Field Work,” considers art and literature’s engagement with the world, in the field. The broadsides are most alive when they are out on utility poles and notice boards. In the field themselves, they do the work of advocating for the importance of art and literature in public life, and they also can be considered a tracking system of sorts, akin to the satellite tags attached to animals which then carry news of their travels. Through “vectorization” and the photos and stories sent back to Broadsided when people share work in their communities, we learn news of where this work goes and whose lives it intersects with. The glorious chaos of the broadsides are set opposite a “report from the field” in the form of photographs and haibun from Bradfield’s time working as a guide and naturalist in Antarctica. At the exhibit opening, the broadsides drew people in. They lingered. They looked and read and some were inspired to begin writing–right there, right then. They were engaged, which is always our deepest hope for the work we publish at Broadsided. 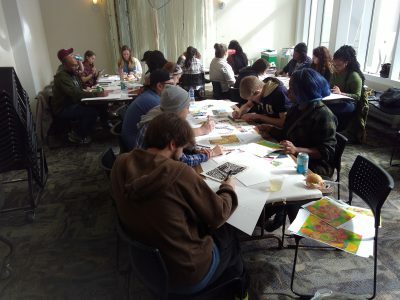 Bradfield also led a broadside-making workshop, bringing together students from the Print, Paper, & Book Arts Society and the Creative Writing Club. In the spirit of Broadsided, each responded to another’s work, from another field. Writers wrote in response to art. Artists painted, drew, and collaged. 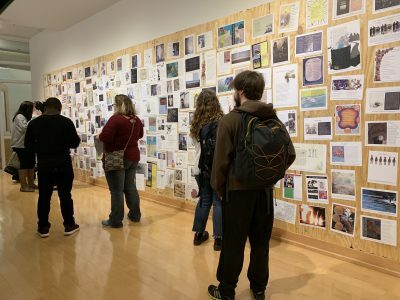 Afterwards, students and faculty shared what they learned about their own creative process from both what they made and what was made from their own work. It’s the belief of Broadsided that the work’s value is not its physical preservation or its scarcity (as it might be in a limited run) but its potential to be printed and reprinted, on demand, by anyone who wishes to have it or share it–the ability of the broadsides to move out into the world. They are at once priceless and cheap. We hope there will be more installations and experiences like this to share in the future. 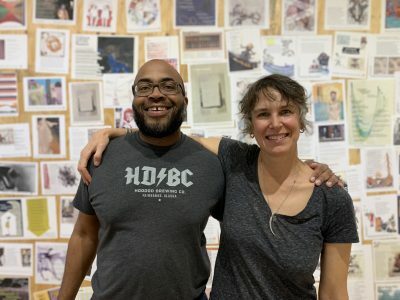 Sean Hill, a Broadsided editor from 2009-2016, a Broadsided poet in 2006, and current Broadsided consulting editor, was key in bringing this exhibit into being. We are so grateful to him for his vision, energy, and generosity (and his friendship and, even more, his stunning poems). The exhibit will be up until February 8, 2019. If you’re in the area, we hope you’ll visit. And send us a photo!